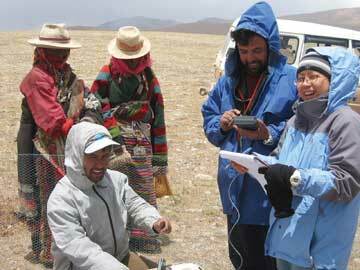 Observed by two Tibetan herders, seismologists Tai-Lin Tseng, Soma Nath Sapkota and Basant Kafle (right to left) recently ran seismic tests throughout Nepal and Tibet to try to locate a piece of missing lithosphere, which they credit for the height of the Tibetan Plateau. Photograph is by Tai-Lin Tseng. Through new seismic work, researchers may have found a clue to why the Tibetan Plateau is as high as it is. A chunk of upper mantle that’s been “missing” for some 15 million years may have contributed to the region’s uplift, they say. Tibet’s ascent to become the roof of the world began about 50 million years ago when the Indian subcontinent crashed into the Eurasian plate, gradually pushing massive amounts of crust material skyward. But many scientists think that it took more than just compression to hoist the plateau to its current average height of more than 5 kilometers. One possible explanation is that around 10 million to 15 million years ago, a large chunk of the lithosphere beneath Tibet suddenly peeled off and sank deep into Earth’s mantle, allowing massive amounts of hot magma to pour in and give the region a sudden, major uplift. Clues locked in the shallow part of the lithosphere, down to about 200 kilometers, had supported this hypothesis, says Robert van der Hilst of MIT. But until recently, any physical or seismic evidence of this piece of lithosphere had been missing. Now, Tseng and Wang-Ping Chen, also of UIUC, say they have spotted it beneath Tibet, and their findings could provide a clear observation to support the hypothesis. Between 2002 and 2005, Tseng, Chen and their colleagues wired a large array of land — from the plains of India, through Nepal, across the Himalayas and into central Tibet — with more than 200 seismic monitoring stations. Using high-resolution seismic profiles recorded at many of those stations, Chen and Tseng measured the velocities of seismic waves traveling beneath the plateau and constructed a high-resolution profile of the region from 350 to 700 kilometers below the surface, covering a distance of about 800 kilometers. Reporting in an upcoming Journal of Geophysical Research, the team found an area 350 kilometers long and 450 kilometers wide beneath Tibet through which seismic waves traveled faster than through corresponding depths beneath India. Because seismic waves speed up when passing through colder rock, Tseng and Chen attributed the anomaly in their profile to a chunk of detached, cold lithosphere that had sunk into the mantle roughly 15 million years ago — the so-called missing link in the rise of the Tibetan Plateau. “When the bottom of the thickened lithosphere detached, the crust lost part of its anchor and was able to rise further,” Tseng says. “Such an event may explain magmatism and faulting,” van der Hilst says. “But to date, very little is known beyond speculation about the deeper structure.” He cautions that there may be room for different interpretations of the structure they found. “What Chen and Tseng see may not necessarily be sunken material; it is possible that it could have resulted from other processes, such as subduction.” It is also possible, he says, that the anomaly is not all that anomalous: Because Chen and Tseng were looking at a relatively small area, it cannot be ruled out that the colder chunk of lithosphere is actually part of a larger structure. Still, the study is a step toward understanding how events happening immediately beneath the surface are connected to the deeper structure in Tibet, van der Hilst says.